Stress has a stronghold on many aspects of people’s lives in today’s society. Stress can impact us negatively and causes health problems, work tension, physical pain and it highly impacts our ability to think rationally and make decisions. Stress often puts our minds into a state that seem inescapable and negative stress tends to create a focus on that element which then causes other cascaded effects that spiral into more negative actions such as self doubt, frustration, anger, loss of confidence and unhappiness. Negative stress along with these results often cascades even deeper where it is very hard to break clear from and so the best way to handle stress is to know about it and know what to do to handle it and eliminate the negative stress in your life. I’ve learned a lot about stress in my own life and in helping others handle significant stress. I’ve learned to use stress in the best way possible and I can access stress as a critical learning tool for personal development. I no longer let stress impact my hope, attitude or faith. I use those together to manage stress and have learned a number of ways to handle, manage and change stress to be useful for self-improvement. Please consider sharing or stumbling this article if you enjoy it and feel free to sign up for my RSS feed here. This is the first and most important point of handling stress, you must first be able to recognize it. Being aware that stresses exist and watching for it is best way to be able to handle it and use other tips to then handle it effectively. If you don’t recognize stress until it already has its grips on you and its impact already affecting your decisions, its much harder to manage it then. Look for the various ways you can be more aware of stress even if you don’t know the cause of the stress itself. This can be down by watching for stresses and for having others recognize it in you as well. All the signs of stress above can help you to identify stress when you may not know the source of it without further analysis. This is where this step comes in and its important to identify what stresses are positive and which ones are negative. The body reacts to different stresses and these chemicals tend to either a fear response or relaxing and enjoyable response. Negative stresses are your body’s way to instinctively handle danger and so the release of adrenaline is typical to increase your senses and provide a heightened awareness and anxiousness to get out of the situation. Positive stresses typically release serotonin, endorphins or dopamine and these can relax you and help you feel enjoyment from the experience. This enjoyment usually helps us to complete that activity, feel good about it and often engage in it again. This happens in personal development, in a job well done or in physical activity since the body releases positive stress chemicals that ‘makes’ us like it. Excessive stress of either type can be dangerous but at the same time, some of both are needed to have any kind of drive or motivation to change, grow or contribute. None of those can happen without some stress stress to inspire / encourage us to do them. So, the stress that is negative is a result of something that you are fearful of and often completely out of your control. You can opt for an Online Pharmacy if needed. Uncontrollable stress that eats away at a person is dangerous as it can be very hard to eliminate as often the beliefs that create the stress are the same beliefs that are emphasized by the same stress itself so it often strengthens even further. Stress that is caused by past events is nearly always negative stress as it is a case where a person dwells on or second guesses a past decision and can’t move past it. The scenarios that didn’t occur are played out over and over in their mind as being better than the decision that was made and is too late to change so this brings on more and more stress. These are just a couple of examples of negative stresses. Its these habits and beliefs that create negative results from negative stresses that need to be changed. Identifying and changing your reaction to be more positive and hopeful can prevent negative stress from taking a further grip. The whole point of stress (from an instinctive point of view) is to alert you to danger so that you can react accordingly and get away from it. If that danger is in your habitual negative response, the body will simply continue to alert you to that with more and more stress. You can also try Musk oil. The differences between positive and negative stress in the body are subtle. The chemicals released vary somewhat but that quickly changes in how we respond to the event as well. It is possible to change the stress by controlling the response we have from a negative stress to a more positive one. If we are hopeful with any stresses towards making the situation better and we do not dwell on the past, the stress can be something that drives you to change the situation and improve it. Most stresses have two sides to them as well (the old famous is the glass half full or empty) and depending on what you see from the stress, this often drives you forward to improve it or to dwell on it and spiral down as a result. Having hope that whatever causes the stress will reside is the best way to ensure you keep looking at the positive outcomes and opportunities from stress. What are the current stress in your life? What good can come of it and how can you use and learn from that to improve yourself, your life or that of others? Just as I stated with the outlook of hope, you can keep a mindset to learn from failures that may have triggered or resulted in the stressful circumstances. You must look at what you benefit there is. This is hard to recognize when our emotions are still stressed but it’s still a great method to not let stress take control of us. Since you will never eliminate stress and you will certainly never get rid of stress that has already occurred, you might as well make the most of it and learn from it. If what you learn can be shared with others to help them avoid a similar stress, then you can move past it even easier and make it a positive event in your life. Some people do deal with stress better than others but we all deal with it better when we have support and love from others when in stressful situations. Talk about your stress and situations that cause it whenever you can with friends, loved ones or even colleagues. Find someone you can trust not to be judgmental or add more pressure. Expressing some of feelings may not change the immediate situation but it always relieves some of the tension to share it with someone else. Most stress results in us feeling like we cannot control the situation and this is most often due to overload and excess pressure. To relieve stress you have to take charge of more influences on you and get away from some of those influences and make time for things that you need to calm your body and mind. Making time for yourself, your hobbies, family, spirituality, solitude, exercise and other enjoyable activities will all help to relieve tension and make the stress much more manageable. You can take action on others tips in this article as well to handle the stress and of course any other methods you have to handle stress, the things that matters, is that you need to take action to manage the stress instead of just letting it build while you keep doing the same thing. If you learn to take immediate action at the first signs of stress you can prevent it from ever building beyond your control and keep your frame of mind to make the most of the stress and use it to your advantage. Perhaps you just don’t know how to manage stress or these tips don’t work for you once you are under under tension. This is fairly typical since you lose your ability to rationalize and make decisions when under stress and so if that is the case, you need to ask others for help who are not impacted in the same way as you. If they are not stressed by the situation, they can easily guide you and help you with any of these tips that you just may not have the strength to battle on your own. The activities we engage in are largely in our control and so we can change our activities to eliminate stress or handle it better. We need to know what situations to avoid or when to engage or disengage from something that will pressure us in a negative way we cannot handle. The best time to do this is when you are NOT under stress as you will be able to make better decisions and see the big picture of what is worthwhile and if any stress can be used to your advantage or not. Analyze your activities and if you are looking to avoid stress that reoccurs in your life, you have to make some changes to your activities if you expect the results of them to change. And finally, this tip is the the one area I feel has the biggest impact on stress. Your beliefs. Beliefs about stress drastically change how you react and what emotions are triggered by stress. If you believe that stress cannot be managed and that it is always negative, then you will typically react that way the emotions you will allow to surface will reinforce this and typically give you that exact result, a very negative experience. On the other hand however, if you belief that stress is something to use as tool to learn from, improve yourself and to use a guide to make your activities the most effective and enjoyable, you can much more easily recognize stress and use it to your advantage by looking for stress that can help you in that journey and to quickly react to improve your situation. Doing this, turns stress into positive experiences and you can live much more in the moment and with hope instead of dwelling on problems and being stuck in the past. Beliefs can be changed by changing your knowledge of a subject but they typically require some reinforcement as well. Take these tips and think about how you can apply them to easily manage stress in your life. Read about people and autobiographies where individuals have overcome tremendous stress in life and made the most of it, to surpass great hurdles, terrible circumstances and massive challenges simply by changing their beliefs and have the inspiration and drive to most past them. You can do the same with stress and turn it into a tool that only makes you stronger and guided in a way that improves your life more and more. I hope these tips encourage you to improve the way you manage your stress and that you can eliminate negative stress and make it all positive in some way. While you can never completely eliminate all negative stress, you can learn to quickly change it and make the most of it! Prev: Bring On the Passion! Thanks for this. I like it how you differentiate negative stress. Not all stress is bad. Some if it can just be used to work for us, some of it is better to be eliminated. You’re right – Our beliefs about stress go such a long way in determining what we do about it. I know people who feel they must tolerate it and bury whatever it is bothering them because otherwise it means they are weak. Stress is meant to be a short-term strategy so when it’s allowed to build up, fester and become long-term, it has an impact on our immune systems and causes health and behavioural problems. .-= Reeta Luthra | Stress and Health´s last blog ..3 Personal Development Questions That Will Change Your Life =-. Good recommendations. Handling stress is not that easy unless you practically feel it and solve it. The most stressful time for me is when I start thinking about my responsibilities as a son of two old parents. There’re so much things that I’ve to do! I’m a part time employee and a part time student. Learning from failures instead of dwelling on them was one of the hardest lessons for me to learn. As someone who is constantly trying to improve myself, as well as accomplish my dreams, it’s hard for me sometimes to draw the line between reviewing what went wrong, and constantly just dwelling on a failure. @Eduard – Thanks for the feedback and yup, there are definitely advantages and things to learn from stress, it’s not all bad. @Reeta – I think that the reason to bottle up stress various, but yes showing weakness is certainly one of the reasons people hide it. AND oh ya, Stress definitely affects the immune system, or how we deal with the stress actually, more than the stress itself. @Alvin – Life does have a way of sending its challenges at us doesn’t it. Being busy though doesn’t cause the stress directly, its how we see the tasks and responsibilities. I’d recommend looking at how you can put benefits around those responsibilities Alvin and use the experiences to your advantage. Perhaps that is in support and love for your parents or in overcoming adversity to be even stronger. Everything in life is a teaching tool and you can see it that way or as a stress that bogs you down. It’s your choice to chose the former and benefit from it. @Sid – Unfortunately I think most of us have to ultimately learn the hard way to differential failure and what is to be learned from it. Second guessing our decisions or even regretting them is a sign of dwelling on things. You simply don’t ever do that when you have every intention to learn from failure instead. I made one resolution at new years and it was to make more mistakes to learn from this year than I did last. It’s actually helped a lot to reinforce this mindset as I have it framed now so any mistake is a lesson to be learned from and I can immediately look for that lesson and move on. It’s the only resolution I’ve made and it’s one I will stick with. Great points Mike. Breaking the stress cycle is so important if we are going to enjoy our lives. It’s amazing how changing our perspective can completely alter the way we respond to situations. Even with trying circumstances, having the right attitude can actually change our hormonal response. The stress hormone is extremely destructive and learning to “handle or eliminate negative stress” brings many benefits. .-= Jonathan – Advanced Life Skills´s last blog ..Aging, Can You Control It? =-. Great job putting this together. We need to be able to identify, recognize the negative stress in order to be able to work towards relieving it. Once we know a problem exists we sure can work towards finding a solution for it. .-= Cheryl Paris´s last blog ..Saturday 9: Gimme Three Steps Girl =-. @Jonathan – thanks and yes, I’m continually amazed at how much in the body and mind changes simple by our choosing to respond with a different attitude. It’s an incredible tool and a very powerful one for handling stress. @Cheryl – thanks for your comment. You are right, when we are able to recognize some limitation of how we handle stress, we can work towards improving it and ultimately solving the problem. A good article towards the human being’s perpetual yearning to seek perfection. Hopelessness in Islam is a sin…so as we say, do your duty and leave the rest to Allah….. Thank you for the great article about the worst killer of modern times…. Stress is NO.1 Killer according to studies of heart attacks. The sooner we realize that the stress is becoming too much we shall act on the spot to eliminate it. From my own experience, it took me few years to overcome the amount of stress. I carried with me all day my assignments, but at that point, I did not realize that it was too much stress until later on when I suffered some low-grade depression. There is no problem now and did not need any medication for it. However, doctors want you to go on pills but for some people medicine is not the answer. .-= ZuzannaM´s last blog ..TALL MOUNTAIN =-. I can highly Identify with #3. When I think of something that could possibly cause worry or doubt, I immediately catch that thought and negate it by focusing on something positive. I’ve found when I focus on negative thoughts I go it causes a snowball effect of more negative thoughts to follow. However, when I focus on thoughts that are less stressful and positive, then it puts me in a better mood. Thanks for this post it’s very helpful! Keep up the great work I’m reading on and on! .-= Jarrod@ Optimistic Journey´s last blog ..The Benefit of Living an Optimistic Lifestyle =-. Hi Mike, I can’t remember where I read it but not too long ago I read quite a good article on stress and how some of it was good for you and you couldn’t live without it. I had never looked at it that way before and it really opened my eyes. As I read your list of symptoms of negative stress I see that most of them are things that are increasing for me. I’ve been letting myself get stressed in a negative way over the last few months. .-= Stephen – Rat Race Trap´s last blog ..The Sunk Cost Bias Mind Trap =-. @Hamid, even with some different beliefs (I’m Christian) its easy to agree that trusting and having faith in God can bring an immense amount of peace to the mind and help with coping with stress. I believe the steps in the article are still neccessary though regardless of that faith to turn negative stress around and eliminate it. That will not happen on its own without working toward changing those beliefs. @ZuzannaM – Oh I didn’t even dare to go into the medicated aspects of stress and I support you 100% for learning to manage your stress in your own life without medication. I’ve seen countless times how medication simply prolongs and false blocks stress that is still existent in people’s lives, but just on hold or out of mind due to medication. I don’t care for pills for anything but severe trauma and pain and think most other medication problems can be dealt with in a much more intelligent way. @ioana – Thanks, its nice to here when content comes as a nice surprise to people and I appreciate your comments. People’s moods are definitely influences by their stress so its always helpful to reframe things to be something we can learn from and improve instead of dwelling on the problems. @Stephen – Thanks for the honesty, we all have time were stress seems to build and creeps up on us. I hope I’ve helped you catch it and given some motivation and tips to help you deal with it. Thanks for the helping to promote this as well, its much appreciated! I have been studying about stress since I wan in high school. I wrote a term paper about it and i realized now that stress is still a major killer in society. I myself have experienced getting sick because of too much stress. I might try to learn meditation in the future. The main antidote to fight negative stress is the management of our thoughts. For instance,always consider that all of us have problems, not only you. Many persons trend to think they are alone on their struggles. However I agree entirely with the author of this article. These are Really Good Tips. I love this tips. 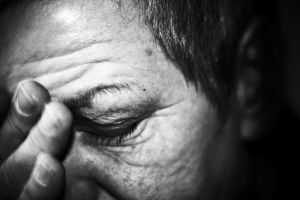 A great article that can help you identify and recognize the negative stress, that way you can work towards relieving it.